Today respected radio portal NPR (National Public Radio) brings forth “The Nonlocality Trilemma,” from sci-fi death metal space voyagers, WORMED. The exclusive track premiere comes from the band’s forthcoming studio outing, Exodromos. 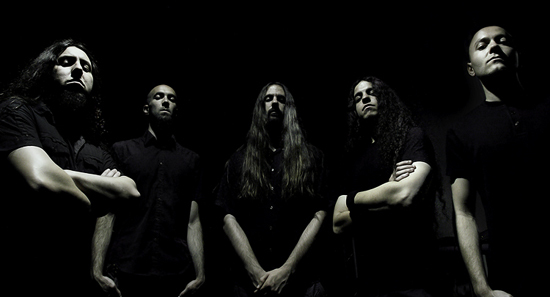 Commended for its “astronomically high mindfuck factor” by Decibel Magazine, the 10-track production serves as the prequel to Planisphaerium (originally released in 2003 in Japan then remastered last year by Willowtip), which centers itself around futuristic science concepts and chaotic visions of the last human left in the cosmos. Recorded at Sadman Studios in Madrid, Spain and mastered by Mika Jussila (Amorphis, Impaled Nazarene, Children of Bodom, Nightwish etc.) at the infamous Finnvox Studios in Helsinki, Finland, Exodromos will be unleashed upon the masses on March 26, 2013 via Willowtip Records. Comments the band of the pulverizing hymn: “’The Nonlocality Trilemma’ talks about the escape of Krighsu from planet Earth. This is one of the tracks where Krighsu begins to question life and worth of his mission. Their extremely technological spacecraft takes off quickly and breaks the barrier of space time through the interstellar medium in seconds, leaving the solar system forever. Krighsu is one of the main characters in the WORMED concept. He represents the consciousness of humanity in a futuristic and technological context. He carries the human seed, and he's the last hope of human life. The album in particular talks about the demise of the solar system and the universe in the year 8K. Krighsu is entrusted with the salvation of human life." Turn up “The Nonlocality Trilemma,” and shatter your planet HERE. Sophisticated, sharp and meticulously calculated, with Exodromos WORMED hurls a maniacal ambush of concentrated brutality and deep space delirium. Made of dissonant yet dynamic hyper-technical guitar traveling at breakneck speeds, the record offers up some of the band’s most technical and plainly obliterating material to date. For Exodromos preorders, got to THIS LOCATION.